So last year I embarked on sewing. This year it is about gardening. I am just all about this DIY recently because I am just dissatisfied with current products or just too poor to keep purchasing things I can make myself. I also hope that when I am old an grey I can teach my grandkids a little about being self-sufficient along these lines. My motivation to begin and attempt gardening was right after I finished making my first batch of all natural soap. In order to preserve it I added organic Rosemary extract which for 1 fl oz was $35!!! and I used almost 2/3 of that for my small soap batch...eeeyeah, I know, my pocket book is still crying. That usually is the turning point where I figure out if this would be easier and cheaper if I did this by myself - plus more fun! So I made a commitment to plant my own rosemary plants and make essential oils from it (that will probably be a separate experience in the coming months). Raised-bed gardening is a form of gardening in which the soil is formed in 3 – 4 foot (1.0–1.2 m) wide beds, which can be of any length or shape. The soil is raised above the surrounding soil (approximately 6 inches to waist-high), is sometimes enclosed by a frame generally made of wood, rock, or concrete blocks, and may be enriched with compost. I decided to start my gardening attempt pretty small because I like to do things on a budget first before I invest more into it. I surveyed my backyard and from my previous experience of planting with my dad (tomatoes mostly and some flowers) the weeds were annoying and high maintenance. I also attempted a contained (in a barrel) herb garden several years ago and my dad like stuck several other plants in there that killed all my herbs. So I thought a raised garden bed would be the best defense not only from weeds but from the meddling of my father. Nothing like a wooden barrier that says for you, OFF LIMITS! I did some simple research online on how to build one which seemed pretty easy: wood, nails, standard power tools. done. In terms of what to plant and what type of soil to use, etc I had to do a little further research which spanned, blogs, books and chatting it up with Home Depot peeps - I want my herbs to be healthy, organic and come out right (its like having less expensive, low maintenance children, but you still want the best for them lol). The book I checked out from the library that I am definitely going to invest in because it is an invaluable source for herb gardening specifically and has a herb encyclopedia is called Better Homes and Gardens: Herb Gardening . Putting together the wooden part of the bed took about 45 minutes. I built a 3ft x 5ft box. We sawed (I mean my bf sawed lol) two planks of redwood (use a not-prone-to-rot-chemical-free wood) to the right lengths and we used long screws to drill into the wood. The hardest part was sawing actually! My dad's 68 year old friend ended up coming outside to show us urban kids how to saw something properly (leveraged and at a angle is the key!). We laid down newspaper to prevent weeds from coming up (if you are an anti-chemical freak like me, I double checked to see that newspaper is not only biodegradable (duh) but the ink is soy-based (yay)). We used Kellogg's organic raised bed potting mix (which Home Depot said is all the rage for the last couple of months) and I have to say I am pleased with it so far as well. 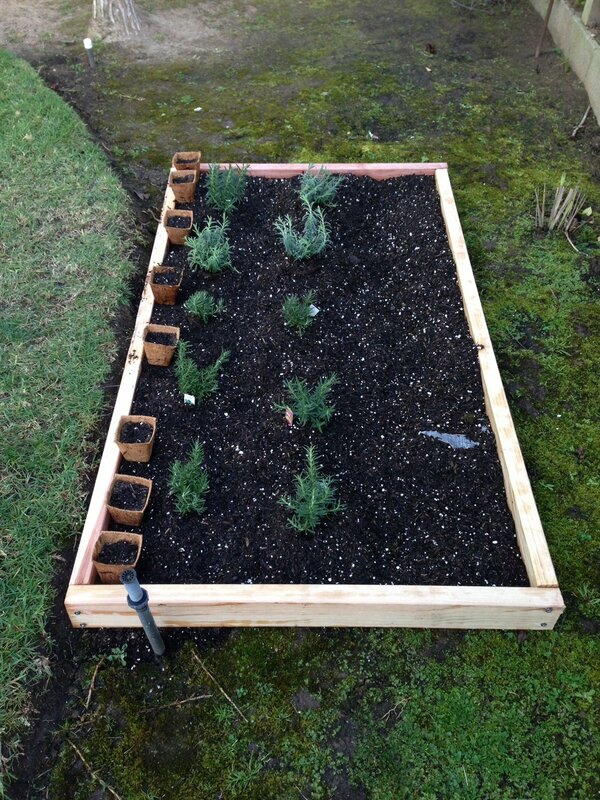 I planted 7 Rosemary plants (about $3 a pot) and 3 lavender plants. I also ended up doing some seedlings since Home Depot nor any of the local nurseries had any budding Marjoram or German Chamomile (plants which when they come of age will be contained individually since they are ravenous (for water) and their root systems are extensive). I am hoping in the next coming weeks I will find some other seedlings that will bode well in a raised bed with my sun-gulping lavender and rosemary - maybe some eucalyptus or lemon balm...who knows? I found the skys the limit when it comes to gardening. Right now I am waiting to see my kids grow up in time for harvesting!